Come Visit Beacon Hill Farm. Llaugh a lot, and llearn about Llamas. You will be charmed and amazed by these wonderful animals! LC-Llamas. His has seven crias on the ground and they have definitely fulfilled our expectations. Check them out below and on our "New Crias on the Block" page. Serpiko is available for limited breedings. We have become active in learning how to spin and process our wool and thank our spinning teacher, Margaret Tyler of La Mesa, for all of her wonderful tips. To learn more about our shearing activities and wool, please go to our wool page. Build your llama Image with llamas from Beacon Hill Farm. Send mail to rebaak@aol.com with questions or comments about this web site. Thank you for visiting the Beacon Hill web page. Shown below is Ken Jones, our shearer from New Zealand And doesn't everyone look spectacular. Have to admit a couple of our llamas received some funky haircuts, courtesy of Ken's enthusiasm. Even the Great Pyrenees, Dana and Mac Duff (Duffy), sport new "dos". They are full of energy and very happy. Our next scheduled shearing will be in April, 2005. Call for information. 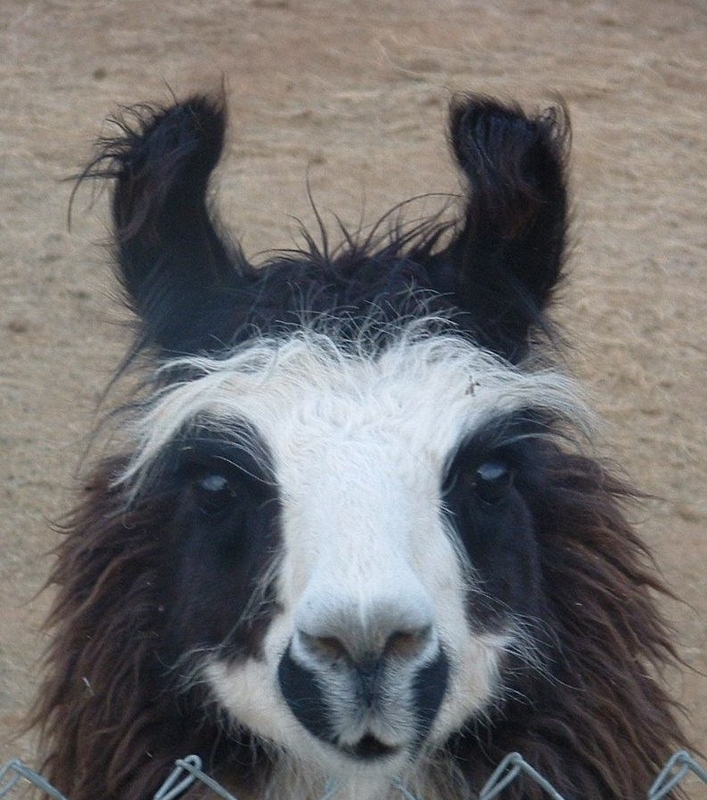 When the Inca Indians of Peru domesticated llamas and alpacas more than 5,000 years ago, they had specific uses in mind. 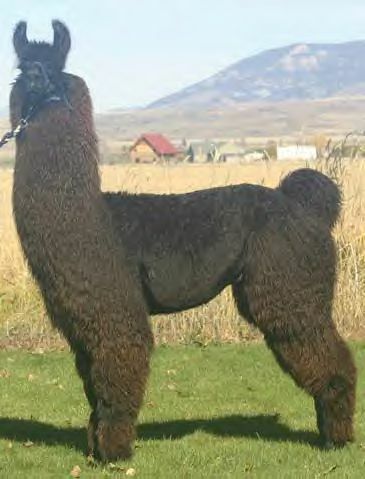 Alpacas were selectively bred to yield a fine, uniform fleece and the wool was used in making garments which kept the Incas warm in the harsh Andean environment. Archeologists have discovered fine woolen goods (with weft counts of 190 to 240 threads per inch) which they believe were used in ceremonies and as burial shrouds. 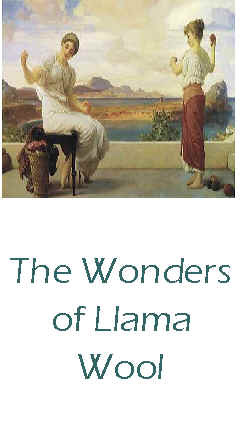 It is considered a natural, protein fiber since it grows freely on llamas. * It has a hollow core (called medullation), giving it a good weight -to-warmth ratio and making it lightweight. The degree of medullation decreases with fiber diameter, and the finest fibers can be solid with interrupted medullation. Technically speaking, it is not wool but many refer to it as such. 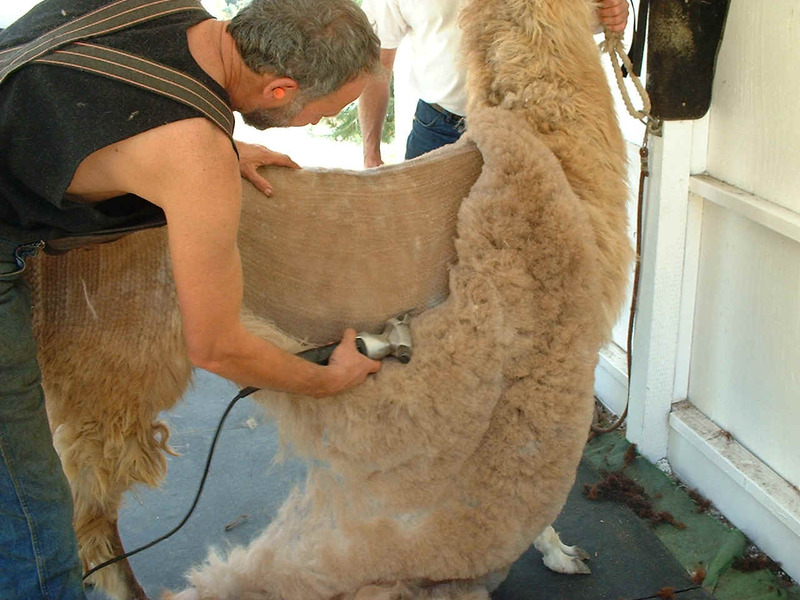 A whole fleece consists of two coats: guard hair and down. Guard hair is thick and without crimp, making it excellent for use in rope. It varies from 0% to 20% of the total fleece of an animal. Down is soft and luxurious, suitable for finer garments. Individual fibers range in size from 20 to 40 microns in diameter. One micron = 1/1000 millimeter or 1/25,000 inch. Llama fiber contains no natural oils or lanolin, making it light and yielding 90% to 93% of its original weight when processed. It shrinks little in washing. A myriad of colors can be found ranging from white, light brown, dusty rose, dark brown, gray and silver, to black. * White fiber takes dye well but, like other fine fibers, is subject to alkaline damage. For this reason, natural dyes work better than some synthetic dyes. Collection of wool can be accomplished by shearing or brushing. When shearing, one harvests the entire fleece, including guard hair and down. By brushing, only the down is harvested. Because of its fineness, thin yarn that is double plied yields the softest, yet strongest yarn. However, it can also be spun thick or as a single, or blended with other fibers. Has little or no memory, making it excellent for use in weaving. When used in knitting, raglan sleeves work well, and adding elastic thread in ribbing will help hold the shape of a garment. Skeins and garments should be washed in cold water with a mild dish washing liquid such as Ivory. Woolite is not recommended because of its alkalinity. 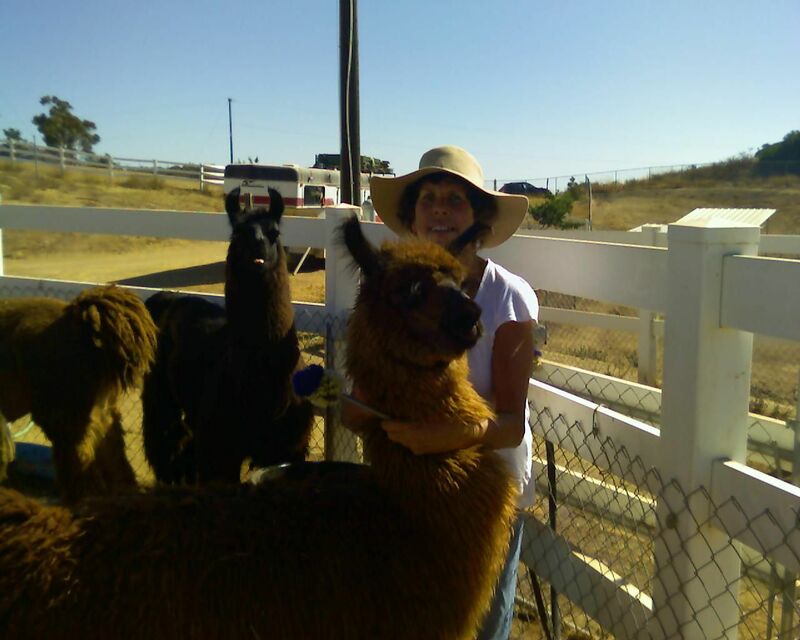 Be sure article is totally submerged since llama fiber tends to be water repellent. Wet garments should be handled with care so they will not lose their shape. Harvest the fiber after sufficient grooming. Collection can be by brushing or shearing. Skirt and separate usable fiber into like piles. Dirty wool should be discarded. Shake out any debris by gently pulling the locks apart. For finer garments, remove guard hair by pulling the long, thick ends. Card the wool to align the fibers. Can be done by using hand-cards, a drum carder, or sent to a mill for processing. Spin the wool into yarn by twisting it as you draw it out to make it thinner. Use a spinning wheel, drop spindle, or a spinning service. Gently wash the yarn to set the spin . * When dry, your yarn is ready to be crocheted, knitted, or woven into a lovely memento of your llama. Felting is another excellent use for llama wool. It is an even easier technique than spinning and yields quick results. Our thanks to Holly Eakes for compiling this information.